“The most precious thing you have is what you cannot hold in your hand” is a paraphrase of something Steve Champion (Adisa Kamara) wrote about the power of mind over circumstance. Philosopher, poet and resident of Death Row, San Quentin, Steve is one of the contributors to an exhibition of art and words at Sun Pier House in Chatham, Kent. In fact all the contributors are awaiting execution at the infamous Californian state prison. I went along because my partner is curating an art and text online project on the subject of death and related matters. These guys though are trying to transcend the apparent horror of solitary confinement under a regime where every day could be your last – and many of them have been living this life for 20 plus years. 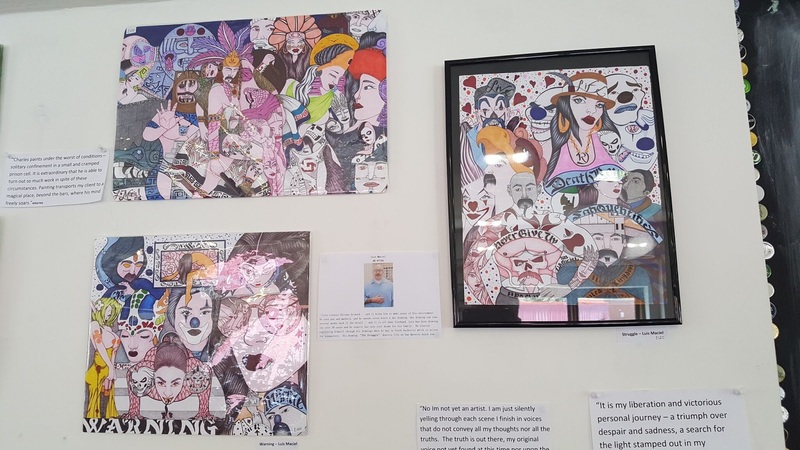 Through art, poetry and philosophical observation they are finding calm, meaning, even redemption, to use one of Steve’s words about a fellow ex-Cripps gang member whose life was terminated ten years ago. Some have found that an overt spiritual relationship with Christ has helped them come to terms with their daily struggle. 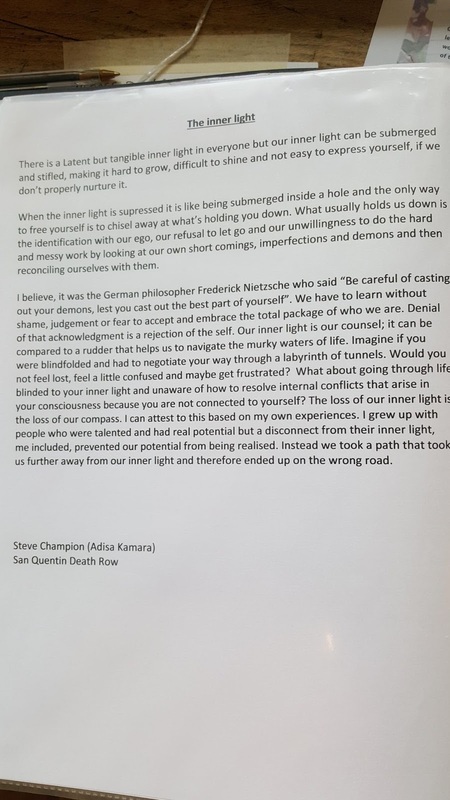 Others, like Steve, have a looser, philosophical connection with Christianity, seeing themselves as on a journey of personal transformation that the emotional denial of their life on the outside made impossible but that solitary confinement makes necessary. This doesn’t mean that he thinks we need to junk all our past experiences. The things that cause us shame are part of who we are and we would not be the person we are without them. This resonated with me. It wasn’t saying that we shouldn’t feel that to have murdered someone is wrong – self-evidently part of his redemption was very much about accepting that. It does mean that if we have been wronged, been a victim, as many who go on to wrong others are, then this will have shaped us. For the most part the impact may be negative, perhaps, but we may also have found what he calls an inner light to illuminate our darkness (see below). I was moved by this, even if the light sometimes shines less than brightly. A wisdom engendered as a survival mechanism perhaps, but not less wise for that. Some haven’t lost their sense of humour either. Gallows humour abounds in the available San Quentin cookbook, subtitled “Your Last Meal?”, the result of how inmates dreamt up ideas to “re-cook” or “re-present” the appalling food they are served up. Some of the art seems to reflect the past lives of some of the inmates, voluptuous female figures are a repeated image. In part this is inevitable among isolated men, but there seemed to be more going on than that. Some of the art is highly skilled, like Keith Loker’s incredibly precise use of the stippling technique (millions of pencil dots) to evoke an American dream car. Another of his drawings, ‘A Mother’s Thoughts’, had the accomplishment of a professional illustrator. Perhaps he is the boy, depicted in the mind of this elderly looking woman, running on a beach. Another part of the depiction is a grave, her own maybe, or most likely his. 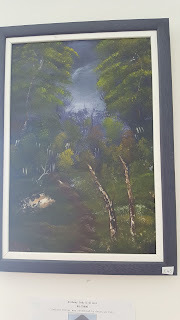 Another Death Row inhabitant, Jerry Frye, wrote of his pride that his paintings were seen by his parents before they died. He presumably wasn’t. I recommend seeing this show. 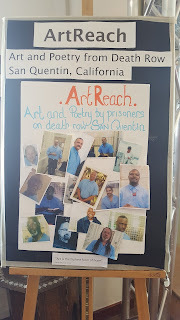 If you can’t, then check out the website set up by the charity ArtReach, which was founded by the artist Nicola White to promote the work of the inmates. It’s a beautiful space, Sun Pier House. 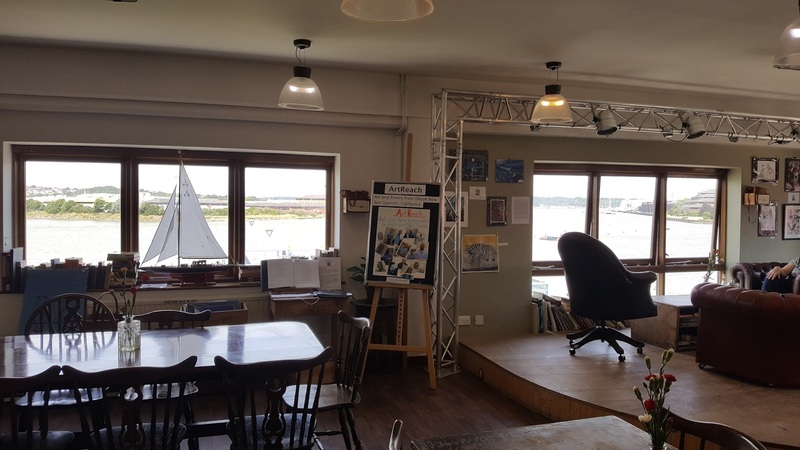 The work and wisdom of these men is glimpsed either side of large windows affording views of swans swimming amidst the old dockyards. 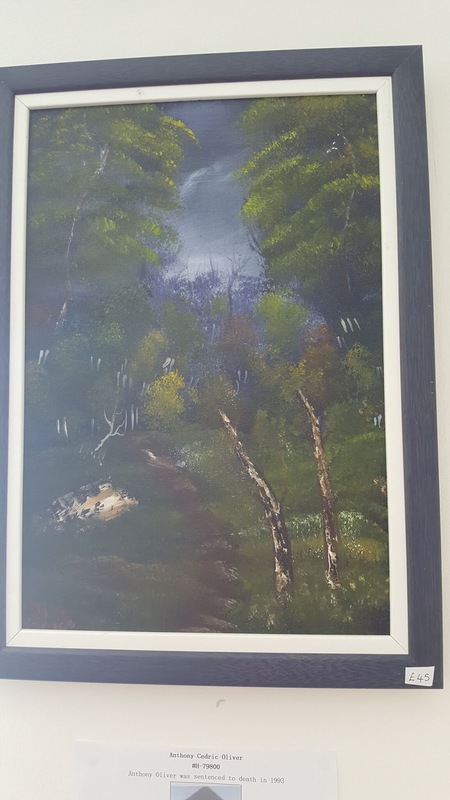 Perhaps it’s fitting that the artists in residence on Death Row, San Quentin haven’t yet made it to the community centre’s official gallery, currently showing impressionistic slices of nature by Medway artists. The inmates’ work is positioned on walls next to dining tables and behind seating in the café. 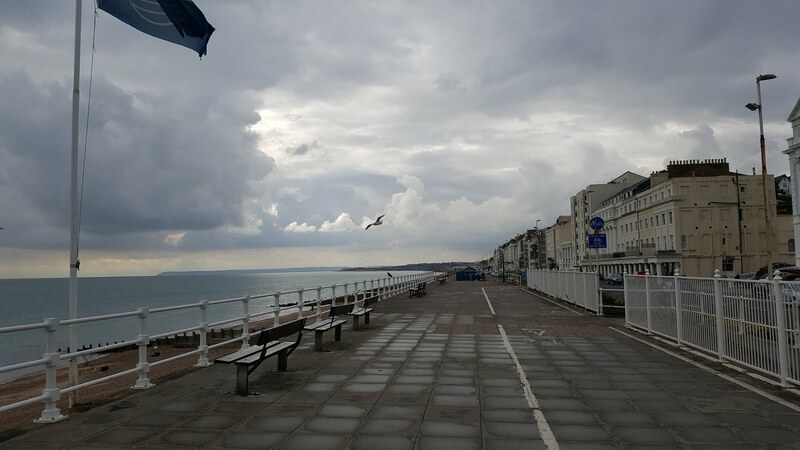 This is in keeping with self-taught artists whose work is from the heart, but it also sometimes made it difficult to fully appreciate the work amidst the mundane chatter of locals enjoying tuna sandwiches. This was also a very English problem of public displays of emotion (engendered by some of what you see and read), and wondering how others might judge you for it. 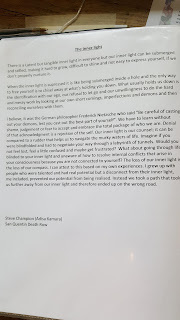 In San Quentin, wrote Steve Champion, you daren't question somebody's "phantom face" (see his typed text below) because prisoner code tells you not to compromise another inmate's emotional space. We, however, are free to do so, but perhaps we don't dare either.